The Subcommittee on Water, Oceans, and Wildlife holds a legislative hearing Tuesday on two of my bills. H.R. 737, the Shark Fin Sales Elimination Act of 2019, expands on a Marianas conservation law to ban the trade in shark fins nationwide. It has strong bipartisan support and 170 cosponsors. H.R. 1809 amends the Pittman-Robertson Wildlife Restoration Act and the Dingell-Johnson Sport Fish Restoration Act to give state-share funding to each non-state area—an increase to $8 million from the $2.5 million the Marianas now receives. The money comes from federal excise taxes on hunting equipment, boats, and other recreational equipment. Funds can be used to protect wildlife and habitat and build docks and other public benefits. The Delegates and Resident Commissioner of Puerto Rico are all cosponsors to H.R. 1809. Similar legislation passed the House in the last Congress, but the Senate did not act. The U.S. Senate may act next week on the disaster supplemental appropriation passed by the House on January 16. Senate Leader Mitch McConnell has filed the necessary cloture motion setting up the vote. What the Senate version of H.R. 268 will include, however, is still being negotiated. Proposals from the Senate Appropriations Committee, Senator David Perdue (R-Georgia), and Senator Marco Rubio (R-Florida) all include $25.2 million for the Marianas food stamp program, as a result of my floor amendment during House debate, as well as $56 million set-aside for solid waste management and $10.4 million for water and sewer projects that we negotiated for the Marianas. 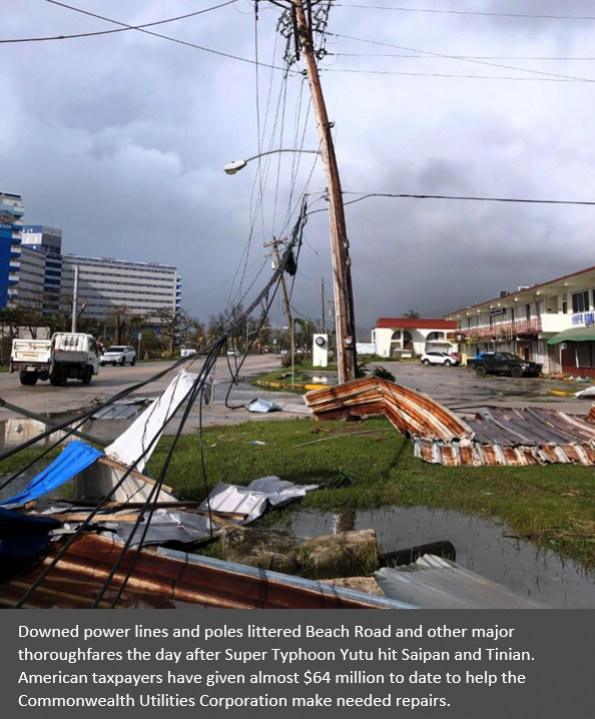 In addition, the typhoons we experienced in 2018 are specifically referenced to make the Marianas eligible for recovery money from the Economic Development Administration ($600 million), Rural Development ($150 million), and the Community Development Block Grant for Disaster Recovery ($1.06 billion). One area of difference: the $36 million for Medicaid that I amended to the House bill during floor debate. 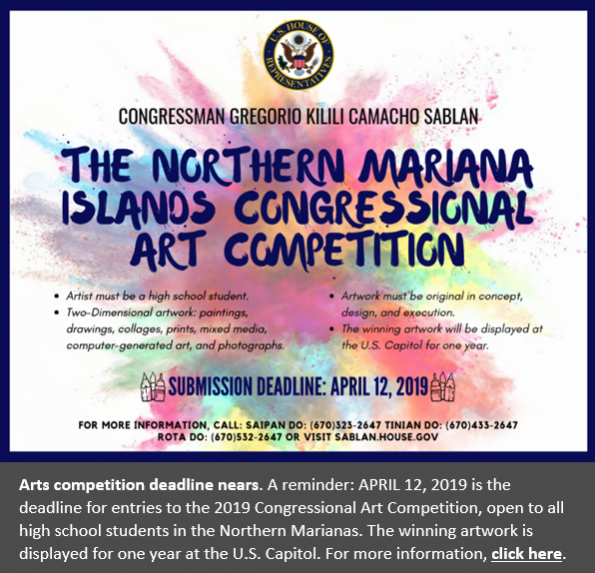 Senate Republicans’ bills have not included this money, even though Governor Torres, also a Republican, has attested that Marianas Medicaid is out of money. The U.S. Small Business Administration will close its Disaster Loan Outreach Center on Saipan at 6 p.m. on Saturday, March 30. 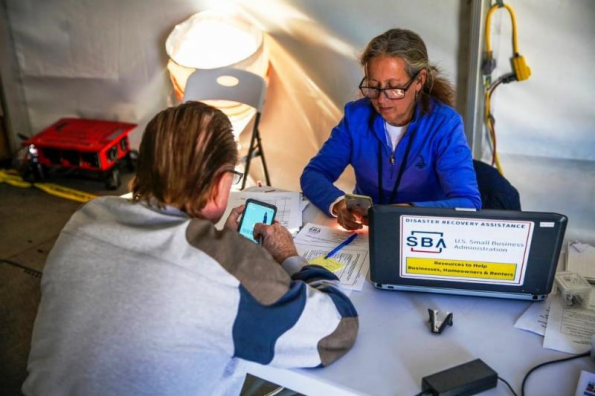 Applicants and borrowers can still receive information and have their questions answered by sending an email to disastercustomerservice@sba.gov or calling the customer service line at 800-659-2955. The hours are 10 p.m. to 10 a.m., ChST. Information on disaster recovery loans is available on SBA’s website at www.sba.gov/disaster. The House is in recess for the District Work Period. H.R. 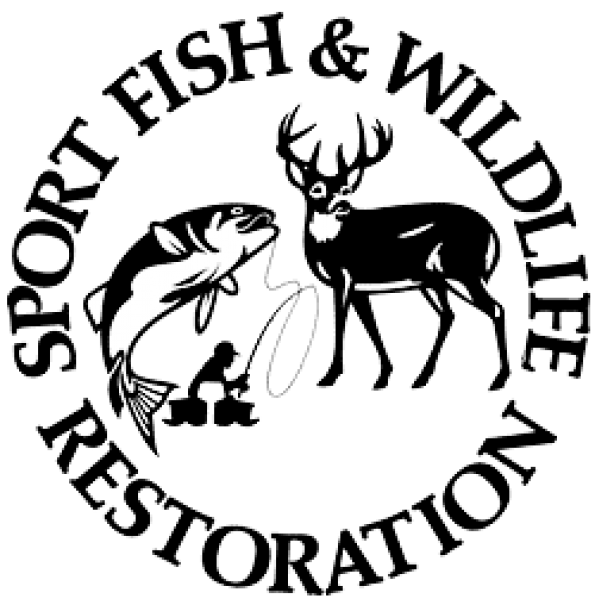 1809 - To amend the Pittman-Robertson Wildlife Restoration Act and the Dingell-Johnson Sport Fish Restoration Act, to provide parity for United States territories and the District of Columbia, to make technical corrections to such Acts and related laws, and for other purposes.